With a stay at Pierre & Vacances Residence la Foret in Flaine, you'll be near ski lifts and minutes from Forum Ski Lift, and close to Lake Flaine. This 4-star residence is within close proximity of Lac de Gers and Moulins Ski Lift. Make yourself at home in one of the 131 guestrooms, featuring kitchenettes with refrigerators and microwaves. Flat-screen televisions with digital programming provide entertainment, while complimentary wireless Internet access keeps you connected. 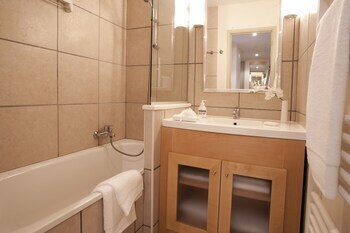 Conveniences include phones and blackout drapes/curtains, and housekeeping is provided once per stay. After a day on the slopes, enjoy recreational amenities, which include ski-in/ski-out access. This residence also features complimentary wireless Internet access and ski storage. Pierre & Vacances Residence La Foret Flaine is an amazing Flaine lodging choice for your trip to France. With numerous amenities for guests, you will wake up at Pierre & Vacances Residence La Foret Flaine feeling excited every day for your time in Flaine. Don’t let this amazing reservation opportunity pass you by, book your stay at Pierre & Vacances Residence La Foret Flaine today to make the most of your time in Flaine, France.